I have been making the drive over to Estes pretty consistently over the past two weeks, putting in some serious effort on two or three hard problems. Pondering the somewhat absurd nature of the enterprise, I ran across this forum topic at 8a.nu, "What bouldering grade would you give Everest?" 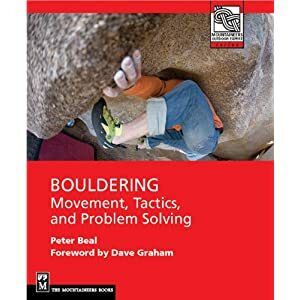 This led to me to consider the relative difficulty of, say, a V12 boulder problem in RMNP, compared to Mount Everest and the likelihood of my doing either. This was thrown into relief by the recent ascent by Jordan Romero, a 13-year old from California, whose success and accompanying publicity recently motivated the Chinese to institute age limits for attempts from the Tibetan side. Nepal has had such restrictions for some time. I feel pretty confident in saying that the main obstacle to my climbing Everest is a large amount of money and time and not much else. It is remarkable that a climb which tested the limits of human endeavor in the 1950s is now essentially a tourist destination. A V12 in RMNP, while commonplace enough today, still demands a kind of commitment in terms of training and dedication that the average Seven Summitter doesn't require. I think for me the sense of total reliance on my own resources to achieve the goal of this grade at my age gives a certain edge to what seems a minor enterprise at best from the outside. I cannot rely on guides, technology, oxygen, or anything else besides my mind and body. The adventure is deeply internal rather than external. Though the obstacles of altitude, oxygen and weather are present (I wonder how many trips to Chaos Canyon equals the elevation gain of an Everest ascent), the hardest one to master is time, especially using it efficiently and effectively in a short climbing season. Perhaps more importantly there is also time in terms of aging; how many more seasons will such a goal remain feasible? My true Everest in bouldering is a solid V13, perhaps a problem like Nuthin' But Sunshine, or The Swarm. Whether I can achieve this is a true unknown but the challenge is a strangely compelling one and continues to draw me onward. I will keep you posted on how it's working out. i'm in my 40's now, onsited my first 13 recently, and just seem to keep getting stronger and stronger and i really don't see an end in sight! i've worked out the moves on v12, and i know that this grade is very accessible, so it's in both arenas that my strength is improving-sport and bouldering. i guess a big thing is that i have willfully refused to buy into the "can't get stronger after a certain age" (age! funny malleable perspective-affecting word, so loaded) mantra that i, especially in the past, used to hear so often. i would imagine that the training i've adopted has a lot to do with the results, but i doubt i would have adopted the training without freeing myself of the age-related thought limitations. anyways, curious about your thoughts in this, and what type of training you do, and if anything has changed as you advance towards death and decay haha. "re feasibility of hard climbing goals with the inevitable decay of body, irrevocably marching towards death:"
i'm in my 40's now, onsited my first 13 recently, and just seem to keep getting stronger and stronger and i really don't see an end in sight! i've worked out the moves on v12, and i know that this grade is very accessible, so it's in both arenas that my strength is improving-sport and bouldering." That sounds great. I think it is perfectly feasible for many if not most 40-something climbers to do the same thing. "i guess a big thing is that i have willfully refused to buy into the "can't get stronger after a certain age" (age! funny malleable perspective-affecting word, so loaded) mantra that i, especially in the past, used to hear so often. i would imagine that the training i've adopted has a lot to do with the results, but i doubt i would have adopted the training without freeing myself of the age-related thought limitations." "anyways, curious about your thoughts in this, and what type of training you do, and if anything has changed as you advance towards death and decay haha." Death and decay are the flipside of change and improvement. They are real but also relative to the individual. Climbing at whatever standard excites you is what is important. The sense of seriously engaging a problem and committing totally to its solution is an effective way of staying alive and energized regardless of age. I will be writing more about my training later but primarily I focus on climbing as much as I can, as hard as I can. Not much systematic strength training right now, just trying to climb as well as I can on the hardest moves I can muster, inside and outside. I agree with Anonymous - I'm not in my 40s yet, but I've been climbing for almost 20 years and seem to be getting stronger - in certain areas and certain ways. Part of this definitely has to do with my mind, how I've cultivated it to push through, hold on, or dig deep. When I was younger it was about being light and using that to be strong. Now it is more about being strong strong. Different, but hard to explain/distinguish. *in terms of elevation gain, you would only have to hike to Chaos 11 times to gain the same amount as one does from basecamp to the summit on Everest. Of course, that doesn't factor in mileage or altitude.